Most car show aficionados know that all concours are now recognizing original untouched and non-restored cars for special awards. For example, Pebble Beach, the grand-daddy of all Concours has a special classification known as the ”Preservation Class ”and presents awards to Pre-War and Post-War cars. Many other Concours have followed their lead. Today the preservation class is one of the most popular classifications at major and even regional and local shows around the world. A number of years back two local MBCA Concours participants, Morgan Taft of the Western Reserve Section and Jim Sweeney of the Pittsburgh Section determined that they loved the shows, but grew weary of cleaning and preening their 3.5 coupes and convertible to the nth degree. Furthermore they each had original and untouched cars and wished to preserve their originality. They also grew tired of suffering deductions and having judges tell them that they needed to replace interior leather and wood pieces and better detail their engine compartments, since they felt that to do so would have spoiled their cars originality. 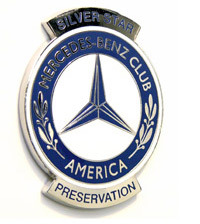 They came up with the idea for a special classification that would recognize original and unrestored cars, now known as the Silver Star Preservation Class, and presented it to Peter Lesler, National Concours Committee chair, for approval by the National Board of Directors of MBCA. This class is for cars 25 years old or older that are largely original and have been unrestored since new. It is intended for driver- quality cars that have withstood the ravages of time, climate and daily driving. It is not intended for “Trailer Queens”-for those we have a Show Class- nor is it intended for rusty and dirty barn finds that do not operate properly and have not been on the road for several years. This classification is designed to formally recognize original cars that meet the defined set of standards by presenting the owner with a certificate commemorating the event and displaying a photo and pertinent data, suitable for framing. It can also add to the provenance of your car whenever one intends to sell or insure it. The certificate awards the owners who have treated their pride and joy gently over the years and have resisted the temptation to restore. As the saying goes," they are only original once" and as we all know, you cannot restore originality! Here’s how it works. Your eligible Mercedes-Benz must be entered in a MBCA sanctioned sectional, regional or national concours. At this writing, to be eligible the vehicle must have been produced in 1990 or earlier. It should be in good working order, driven under its own power to the event and be largely original. Your eligible car should have an original engine and drivetrain. There can be partial refurbishments of various components, but no complete restorations can be accepted. At the event each Silver Star entrant will be given a Silver Star Preservation classification Score Sheet and be instructed how to complete it. The cars are self-judged by the entrant following the form. On the form, the owner informs the judges which aspects of the car are entirely original and which aspects have been altered over time. A Preservation Class Judge, assigned by the Concours Chef Judge will review the completed form with the entrant, evaluating each aspect of the car. If the car has earned enough points to be certified, the Chief Judge and the Class Judge verify the findings and initial the form. A digital photo of the entrant’s car in JPEG format is taken at the show and the completed classification form along with the photo is forwarded to the MBCA National Business Office. 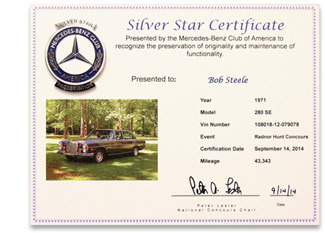 The NBO will create and send to the owner an official Silver Star Certificate formally declaring the car to have met the standards of the Silver Star Preservation Class. The owner may also purchase a specially designed grille badge from the NBO. These banners are available for use at MBCA Silver Star Preservation events. Email [email protected]. Cars may be certified at additional shows in succeeding years. We have certified many cars two and three times over the past few years. Though the Silver Star Preservation classification is not yet well known, it is rapidly gaining widespread acceptance. We certified over 80 cars last year and expect to to do many more this year. If you would like to take advantage of the Silver Star Preservation Classification, talk to your Section event organizers or your Regional Director, they can guide you and advise when and where these events will be offered. Since it is a self-judged form, and instructions are provided, you do not need any special training, just a willingness to have your car recognized by its peers and add measurably to its provenance. If you need further clarification you may also email Peter Lesler, National Concours Committee Chair at [email protected]. The Silver Star Classification Score Sheet can be found on the MBCA.org website clicking on the “Our Community” tab, then on the “Resources” tab and then page down to the “Event Forms”. There you will find all the concours forms. All these forms are downloadable and may be used at all MBCA sanctioned shows.